� About :: Why search? 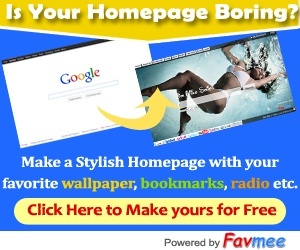 FavMee.com is your own personal page, which you can access from any computer. Its a custom made web 2.0 home page solution for all. FavMee.com is revolutionizing how we use the Internet. With FavMee, you can easily customize the Bookmarks and can easily make the bookmarks public or private. Top 25 Public bookmarks can be viewed on your personal homepage. You can also add thousands of widgets, including news, sports, e-mail, local events, search, photos, music, videos - even interactive tools like a calendar and a to-do list - and just about anything else you do on the Web at school, work and at home. Enjoy surfing. Your Ultimate Homepage. We like to keep it simple. Why search? is the essence of Just4smile-Favs' philosophy. We believe the Internet should be an inspiring, easy and free experience for everyone. We, too, think that there must be an appealing and simple alternative to traditional Internet navigation. That is why we have taken up the task of simplification so that end-users could find what they're looking for quickly, whether they are interested in Entertainment, Games, Kids, Shopping, Travel or anything else. With Just4smile-Favs, users can smoothly cruise on the vast Internet highway without wasting valuable time or having to sieve through irrelevant search results. Our visual platform not only directs users to their sought-after information fast but also introduces them to new and exciting sites, both of the same and different categories. We achieve this through a strict selection process and a back-and-forth dialogue among the Just4smile-Favs team members. This way, Just4smile-Favs acts as a pioneering force of Internet browsing, searching and learning, thereby offering nothing but the absolute best of what the web has to offer. Today, when much of the searches we perform produce considerable numbers of spam, fraud and aggregation sites, we feel someone needs to step up and sift through the Internet so that Internet users' experience is a positive, to the point and no-nonsense one. Just4smile-Favs has a calling and we're dead set on doing it right. What a better way to do so than by the use of the human brain. © 2009 - 2011 FavMee.com :: Make your Own Homepage! !